Waterfund develops financial risk management products for the water industry and is best known for its partnership with IBM to create a Global Water Cost Index. Scott has been based in both the Middle East and Latin America as a hedge fund investor and developer of financial products. He was most recently Senior Business Development Executive at the Dubai Multi Commodities Centre (DMCC), an agency of the Dubai Government, responsible for Dubai Commodity Asset Management, a hedge fund and ETF investment platform licensed by the Central Bank of the United Arab Emirates.Scott began his career in the Commercial Service of the U.S. Embassy in Buenos Aires, Argentina and was an analyst in the International Listings division of the New York Stock Exchange (NYSE). 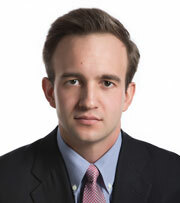 He began his investment career as an associate at Nexstar Capital Partners, an emerging markets hedge fund focused on Latin America.Scott earned his BA from Columbia University and holds an MA in International Economics from the Johns Hopkins School of Advanced International Studies (SAIS) having studied in Bologna, Buenos Aires, Zaragoza, and Washington, D.C. He speaks regularly at water conferences on the topic of private finance and has been quoted and featured in the Wall Street Journal, Bloomberg Television, Fox Business, and other media outlets.